The irony is that for all the time and energy and resources China throws into censoring its Internet, the more creative, ingenious and brilliant those striving to subvert the system become. And the more brilliant and ingenious they are, the more attention they get, and the attempts to censor information blow up in the censors’ faces. This is an absolutely marvelous article, a look at how the wit and humor of irreverent, mischievous bloggers, microbloggers and online artists is confounding China’s fleet of Web censors and doing achieving exactly what the censors are fighting: the delivery of mocking, critical messages revealing the injustices of the Chinese government. I have posted before about the CCP’s total lack of a sense of humor. Every year in America the president of the United States gets roasted at the White House Correspondents dinner. No government figure here or in most free countries is spared from being laughed at. But can anyone actually imagine the CCP laughing at itself? How surprising, that it’s authoritarian and totalitarian regimes that are utterly devoid of humor. Anything that challenges such governments’ monolithic image of paternalism and benevolence is a threat: jokes unveil weaknesses in the rulers, they reveal vulnerabilities, and if they’re really funny they spread like wildfire. Small wonder that those making the jokes are considered lethal enemies. This exhaustive article reads like a thriller and is a good reminder of why we need professional journalists. While it’s largely about humor, and while some of the examples are pretty hilarious (be sure to read the one about Mao), it is anything but funny. The political reality is utterly grim. The use of humor is a last resort, a desperate attempt to enlighten and inform the masses, and a dangerous game. These are acts of incredible courage, and there’s no way China can wipe them out unless it turns the entire Internet off, and cell phones, too. These are real freedom fighters (or “freedom-of-speech fighters”). Update: Relatedly, you’ll want to read this. These censors must be very busy men. And then there’s this. What’s going on tonight? Zhou Youguang should be a Chinese hero after making what some call the world’s most important linguistic innovation: He invented Pinyin, a system of romanizing Chinese characters using the Western alphabet. But instead, this 105-year-old has become a thorn in the government’s side. Zhou has published an amazing 10 books since he turned 100, some of which have been banned in China. These, along with outspoken views on the Communist Party and the need for democracy in China, have made him a “sensitive person” — a euphemism for a political dissident. You simply have to hear this NPR interview to believe it. This guy is sharper than a tack at 105, and he still blogs. His criticisms of the CCP are sharp and specific. Go listen now. NPR and PBS are the sole sources of sanity in today’s US media. Of course, they are among the right’s primary targets. If they go, I go. 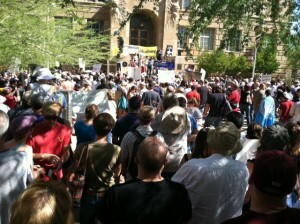 Best picture I could take at Occupy Phoenix, using my phone; I know, it’s kind of blurry. I just came from the demonstrations here in downtown Phoenix and was surprised, in a good way, at what I saw. Thousands of polite, civil, friendly protestors had gathered, and I would say that maybe half of them were white collar people in their 40s, 50s and even 60. Lots of youth, but lots of white hair, too. There was no name-calling, no littering, no shoving, not the slightest hint of violence. I bring this up because the new insidious meme from the right is that those participating in the demonstrations constitute a “mob.” Of course, they considered the Tea Party demonstrations a gathering of patriots. The Occupy crowds, in their eyes, are dirty hippies and anarchists. Which, of course, is total nonsense. There were the expected idiots, but very few. I’m talking about Truthers with their signs about 911 being an inside job, and the Ron Paul kooks with their monolithic call to “end the Fed.” They were few and far between, but it’s always signs like theirs that the right-wing seizes on to show how deranged liberals are. I kind of wished they’d disappear. Free speech has its pluses and minuses. The police were everywhere, quietly watching. I even chatted with one about a deranged demonstrator who was reading from the bible at the top of his lungs trying to drown the speakers out. The cop said he’d love to do something, but everyone’s allowed their say. From the way he said it, I’m betting he was sympathetic to the demonstrators. According to the latest poll I saw, 52 percent of Americans now support the Occupy movement, and 27 percent support the Tea Party. Finally, a movement is bringing together groups that have often been at odds: white collars and working-class workers, young people and old, social rebels wearing masks and clearly challenging the status quo, and the status quo itself — ordinary Americans who brought their entire families with them. The Phoenix event may have been a bit too polite. It needs to be a little more disruptive and in-your-face. That’s a fine line to balance, remaining civil while generating outrage. But it has to shake up the system, like they’re doing in New York. Meanwhile, I’m doing everything I can to support this movement and urge you all to do the same. We’ve never seen anything like it in America in our lifetimes, and it is so long overdue. The Chinese government, one year later, is still simply furious with Norway over awarding the Nobel Peace Prize to NED puppet and criminal Liu Xiaobo. I can’t help but be struck by the maturity and diplomacy with which they are expressing their outrage. Norway has reported China to the World Trade Organisation (WTO) in an escalation of a row about fish which has pitted one of Europe’s smallest countries against the biggest nation in the world. The Chinese imposed additional import controls on Norwegian salmon last year in apparent retribution for the Nobel Peace Prize awarded in Oslo to the Chinese dissident, Liu Xiaobo. The result has been a collapse in sales of salmon to China, and the sight and smell of North Sea fish rotting in Chinese warehouses. The Norwegian Foreign Office said overall trade with China had grown by 46 per cent over the past six months. But sales of fresh salmon, meanwhile, have collapsed 61.8 per cent. Officials said they would not speculate as to why Beijing had ignored trade rules relating to Norwegian salmon. But it seems clear that the threat from the Chinese embassy in Oslo last year, of “damage” to diplomatic ties should the Nobel Prize be handed to “a criminal” has focused on a narrow, iconic target. And China wonders why the world sees it as a prickly, pouting child. Unfortunately, due to the country’s economic heft, the world always has to walk around China on eggshells lest the CCP have its feelings hurt. Via CDT Be sure to click that link and read about Liu’s life one year after his arrest. And then, to top it off, read this. This certainly sound more legitimate than the ridiculous Confucius Prize. Check out their website; it seems to have a lot of backing from prominent figures in the US, like Henry Kissinger. 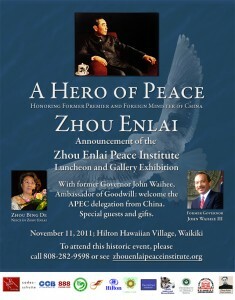 Once a year, on a date near Zhou’s birthday, the Zhou Enlai Peace Award will be presented at a special ceremony held in the Great Hall of the People. An Award will be given annually to a person within China who practices the principles of simplicity, humility, respect and peacemaking, who meets the personal standard of integrity set by Zhou Enlai. An Award will also be given to a person from the other nations of the world, who will be brought to Beijing to receive recognition for their contributions to peace. The ceremonies will be broadcast nationwide, and made available in translation to broadcasters in other countries. 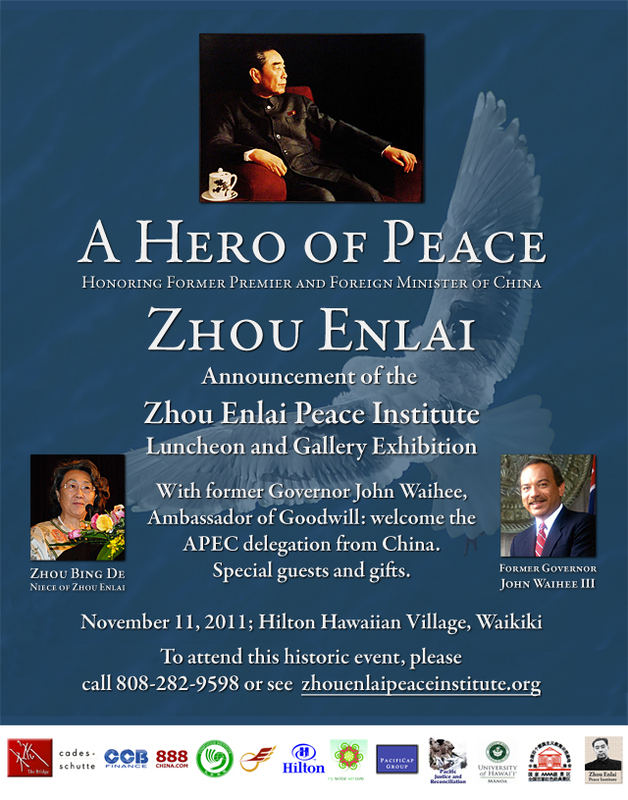 Maybe this helps explain why the Confucius Peace Prize has been unceremoniously dumped? Thanks to the reader who sent me the information.